During a wondrous product keynote with lasers, Microsoft announced plans for their latest tablet device. Here are some thoughts! According to Engadget that live blogged the event, the new product will a size niche between tablet computers such as the iPad, and paper based devices. They also hinted at its functionality. We’re told Courier will function as a “digital journal,” and it’s designed to be seriously portable: it’s under an inch thick, weighs a little over a pound, and isn’t much bigger than a 5×7 photo when closed. That’s a lot smaller than we expected. A compelling size. An iPad is lovey, but can't fit in my cargo pants. In a fit of common sense which I'm relieved to see, it seems Microsoft has admitted nobody really wants to run Windows 8 on tablets, and instead the Courier will run a mobile OS. Rather than Windows 7, we’re told the Courier is built on Tegra 2 and runs on the same OS as the Zune HD, Pink, and Windows Mobile 7 Series, which we’re taking to mean Windows CE 6. As to the UI itself, Microsoft seem to be taking a different tack to iOS and Android by fundamentally rethinking how users input data with a pen-based interface. It'll even fit in well with their recent Barnes and Noble acquisition. [..] centered around drawing and writing, with built-in handwriting recognition and a corresponding web site that allows access to everything entered into the device in a blog-like format complete with comments. 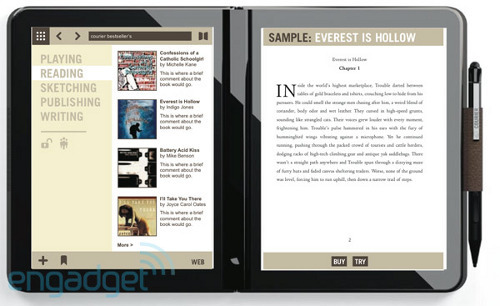 [..] it looks like the Courier will also serve as Microsoft’s e-book device, with a dedicated ecosystem centered around reading. As Engadget said, it "sounds spectacular"! Microsoft have a history of demoing and announcing products that never ship (so called vapourware), but I have every hope this won't be one of those devices. I'll be keeping my eye out. Admittedly, Microsoft haven't excited me for a very long time, but I'd buy one of these in a heartbeat.